Brain training uses a scientific understanding of how the brain works to help you look after the most important part of your body. Your conscious and unconscious thought processes are distributed across the upper part of your brain, the cerebral cortex, with similar areas of the brain being used for seemingly unrelated tasks. This reuse of parts of the brain for different tasks means that improving one part of your thinking capabilities can lead to generalized improvements. Your brain learns not just the exercise itself but also gains intelligence in other areas. 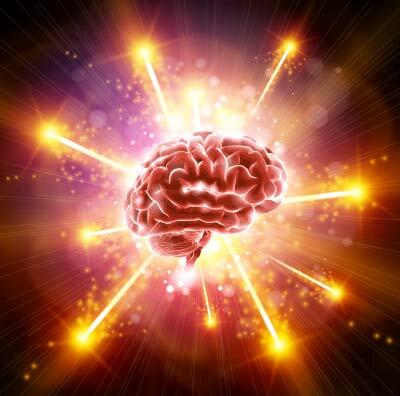 Your brain thrives on novelty and new experiences. It loves to learn, and it particularly likes to draw patterns and inferences from the world it discovers. This learning informs both your conscious thought processes and the many unconscious processes which are going on continually inside your brain. Sometimes you don't know why you feel or think the way you do, but that's because your brain is incredibly good at learning things without you even knowing. You know it's important to look after your body for good health, and it's equally important to look after your brain. Studies show that those who make poor use of their brains are more likely to suffer symptoms of dementia and other age-related diseases at a younger age, and so keeping yourself mentally fit is critically important. There are many ways to do this, such as learning a foreign language, travelling to new and interesting places, and introducing new variations into routines that have become mind-numbingly unchanging. Unfortunately many of us don't have the time to do any of these things, and that's where Brained Up comes in. Brained Up provides a daily brain workout, with a wide mix of different types of cognitive challenge in order to give your brain as broad a range of activities as possible. These continuously adapt to your cognitive abilities, using scientifically-developed algorithms which model your past performances and use these to push you to continually better yourself. It's important to not only improve but also to know that you are doing so, because a happy brain learns better. 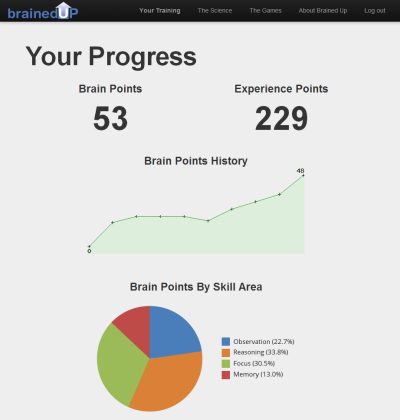 Brained Up includes its own measure of your current cognitive level, called Brain Points. A range of tools track changes in your Brain Points, and give tips on how to push yourself to achieve even more. You can also see how you compare against the average performance of other users in your age group, if you wish. Brained Up includes not just daily workouts but a range of additional brain training activities which are provided as reward incentives as you continue to train. These include both long-term memory tasks based around real-world learning, such as countries of the world, flags and so on, and a range of creative activities. This rich range of content provides probably the most comprehensive programme available, helping ensure that you get maximal cognitive improvement out of your brain training.